iPhone 5S was launched in 2013, still after years it is one of best selling device in many countries. The phone is loved by people because of beautiful design and very optimized OS. 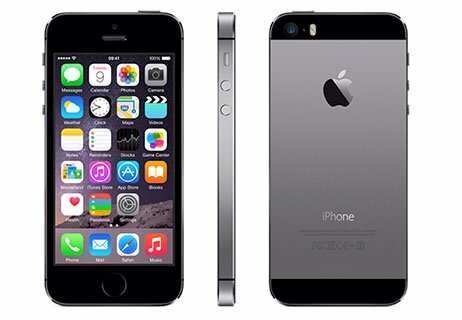 iPhone 5S is still preferred over newer device Apple iPhone 6s beacuse of price and design of phone. This device featuring iOS 7 upgradable to iOS 9.3.2, 4 inches LED backlit IPS LCD, 8 MP primary camera, 16/32/64 GB ROM, 1 GB RAM and 1560 mAh battery. Apple’s iPhone 5S proves itself to be a device with better processor, improved camera features and useful fingerprint scanner. iPhone 5S has been doing well like every high end iPhone. While, iPhone 5S is very much similar to iPhone 5 in terms of hardware. iPhone 5S features a 4” screen that is quite small when compared to Android and Windows Phone. Its display is beautiful and it’s pocketable too. Its Touch ID home button is very smooth and works really well. Not only is this, unlocking the phone very easy for purchasing apps. Its A7 chip is unlikely to become obsolete due to 64 bit architecture. To know more, get the story here. The new A7 chip in the 5S will be is as fast as the iPhone 5. The chip also runs 64 bit architecture and there is a new M7 motion co-processor that enables the developers to access features like compass and accelerometer. Apple promises to enable a new generation of health app and M7 should eliminate the need to buy any sort of health peripheral. Apple offers smooth integration and makes mobile purchasing more convenient. This feature makes the smartphone unhackable but stops criminal from theft. Its Touch ID feature enables the user to unlock device using fingerprint. This time Apple’s camera has opted for bigger pixels with a 15% large sensor and a wider f/2.2 aperture. iPhone 6’s camera has come as an exception with ‘TrueTone’ flash that uses dual, white and amber LED’s for a better colour balance. A new burst mode for taking multiple snaps and slow motion option with 720p video. 5S runs on iOS 7 that features AirDrop, an adhoc Wi-Fi sharing platform through which users can share files with iPhone 5, iPad 4th generation and iPod Touch. After knowing that both 5S and Nexus 5 use updated Google Now app on iOS and found that 5S offers fast experience than Nexus 5. This is the feature where technology is crying and Apple users are asking for innovation. The battery in 5S offers marginal improvement that offers extra hours of talk time and browsing usage. With M7 processor, Apple has made much sense. But, it could have even better. Apple products are expensive, while Apple iPhone 5S for 16GB starts with Rs. 34201 Rs. 19999, while a 64GB model is available for Rs.48290 Rs. 39000. Availability of the device might vary as a 16GB model is available in grey or silver colors. The front camera of the iPhone 5S is only VGA means only 0.3 MP However there are even 16 MP selfie camera phones in market. The quality of front camera photos is quite good but it start loosing details even in minor zoom. 5S looks similar to iPhone 5C, but difference lies as 5S features improved processor, Touch ID and camera feature that makes you to consider this device over iPhone 5. Apple’s hardware is mind blowing with decent functionality. Not satisfied with features or price Check Best Smartphone for Your Budget.